At Dailymotion, we do our best to enhance our viewers experience. It is a known fact that video buffering is a big factor of user frustration, lots of studies and articles have shown that video rebuffering has a significant impact on user engagement. Initial video buffering, also known as video loading time, or join time. Spurious video re-buffering that happens in the middle of playback when video buffers become empty. In this post, we’ll explain the different directions we’re exploring to reduce video loading time. redirecting our videos to different proxy (Dailymotion’s one and/or external CDNs) across the globe to reduce network latency and increase download speed. An “Ad Slot” during which Ad plugins will determine whether an inline video ad (also called a preroll) should be displayed before the actual video. if Ad plugins decide that an ad should be displayed, preroll video will be displayed in this same slot. A “Video Slot” dedicated to the playback of the actual video content. Prefetch these manifests during preroll: these are tiny files, and care should be taken to ensure that their loading has no impact on Ad Loading. This manifest prefetching has been implemented in our Flash and HTML5 Player, and we can observe a significant drop of median video loading time from 2400ms to 1100ms in our Flash Player. Ad Loading time and Ad Display time also remains stable. No impact on Ads revenue. The gain in our HTML5 Player was less substential. The reason why loading time reduction is significant in Flash is that our HLS media engine, flashls, supports progressive fragment parsing: the TS packets are parsed and transmuxed into FLV packets as soon as they’re loaded: therefore the playback could start even though the first fragment is not fully loaded yet. does not support onprogress() event on binary content. Thus playback could only start after the entire loading/transmuxing of the first fragment into ISO-BMFF format, and video loading time is higher in HTML5. Fetch API will resolve this, but it is still an experimental feature and not yet available mainstream. 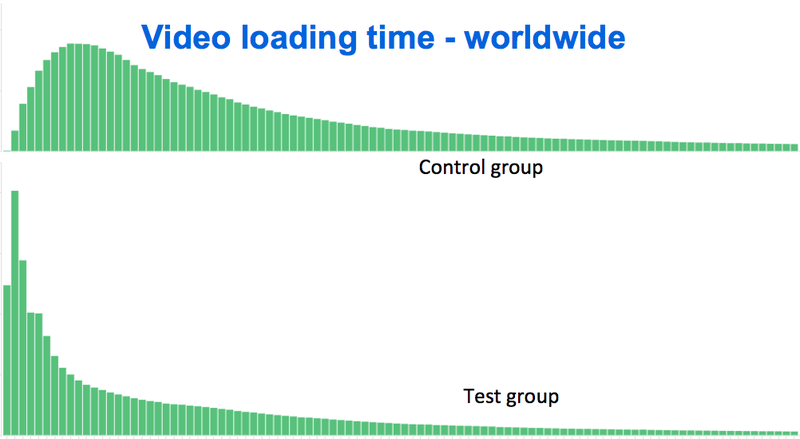 To further improve video loading time, we decided to A/B test stream prefetching: the idea is to prefetch both manifests but also first video fragment during the Ad slot. hls.js supports manifests and first fragment prefetching, even if <video> element isn't available (as it might be used to display a preroll video). Refer to this config parameter. 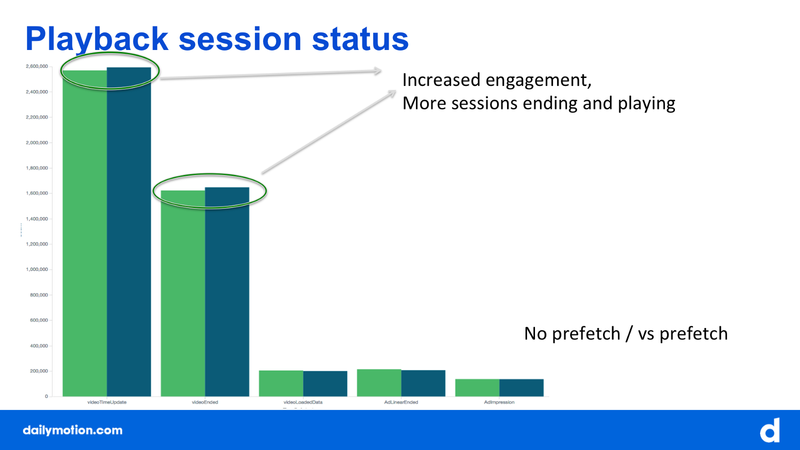 See results on video loading time distribution below: as we can see the loading time is significantly reduced — by half — for most playback sessions. as it can be seen below, more users are watching to the end of the video; which is a good way of showing that streaming experience was better overall. On the revenue side, we also noted that although the preroll revenue decreases slightly, it was compensated by an increase in midroll / postroll revenue. So overall, we provided our viewers with an improved streaming experience without compromising our revenues. We continue our quest to enhance user experience, and the next step is to enhance hls.js ‘ ABR algorithm, through A/B testing. Originally published at engineering.dailymotion.com on July 11, 2016.